A dog sits on the ground of the beach dirt road by their owners. 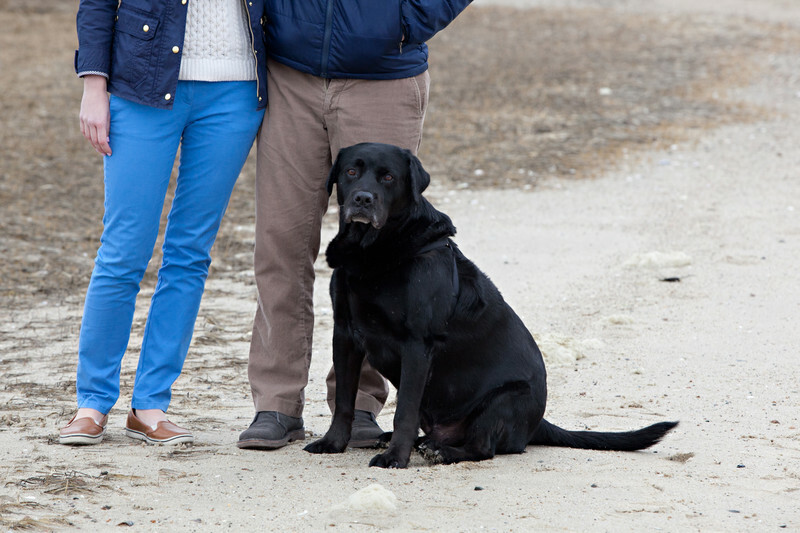 Aislinn and Derek had wanted to incorporate their dog into their engagement beach photo shoot. The dog was very special to them and he was such a valuable asset to the photos. He became my best friend while shooting. He loved the beach and being the winter we are able to take him down the beach and let him run around. He was very cooperative for photos. I always love when my clients want to incorporate something special into their shoot. I am a huge dog lover so I will never say no to bringing a dog to an engagement session. Some local beaches don't allow for dogs on the beach, but in the off season no one really pays attention. We were shooting on the Cape and you never know what the weather will bring, but we ended up with a pretty mild day for being on the beach in the winter! I was so sad to hear that the dog died a few months later because he was one of the couples first pets.